Three times over the last fifteen years I've tried to learn my nonna's recipe for making her signature sugo, ragù alla bolognese. I've watched and listened and scribbled in my notebook as she's talked me through the process in a mishmash of English and Italian. Soffritto of garlic, onion, celery, carrot. Herbs and spices. Tomato. Meat. Wine. Time. But whenever I've tried to replicate the recipe at home I've been dissatisfied with the results, no matter how meticulous I've been. There's an intangible spark, an Italianness, that my sauce lacks – which I consider supremely ironic, given that her sugo was created then developed in Australia, rather than in the country of her birth. My nonna Livia grew up in a village in the Veneto near Treviso, then lived in Monfalcone, a ship-building town in Friuli-Venezia Giulia that was bombed into ugliness during the war due to its military significance. As the 22-year-old bride of an Istrian Italian disillusioned after his home town became part of Tito's Yugoslavia in the post-war redrawing of borders, Livia boarded a ship in 1950 with her new husband for a new life. It was a hard life. For the first six months in Australia, including several weeks interned in Albury's Bonegilla Migrant Camp, she cried every day for the parents and siblings she'd left behind. She was disgusted to learn that Australians cooked with dripping, and that olive oil was available only from a pharmacy for presumably medicinal purposes. And for all her continental snobbery, Livia found herself unable to produce dishes that met with her husband's exacting standards. 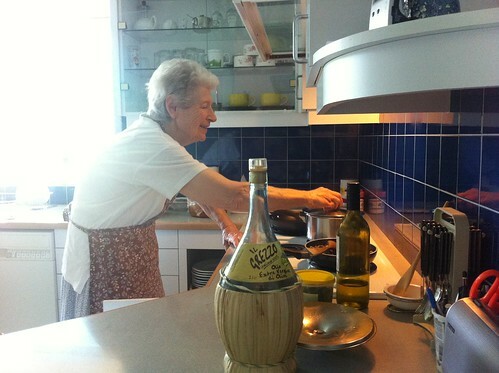 Although her parents had run a trattoria/bar in the shadow of Monfalcone's train station, her duties had been confined to front of house and as the youngest daughter she had never been taught to cook. Salvation came in 1952 in the form of a cook book in a language she could read, transported by special request from Italy by her brother when he too migrated to Melbourne. Il tesoretto della cucina italiana by Giuseppe Oberosler was a 600-page tome containing 1,700 'practical, economical and tasty recipes for family use'. She still possesses it to this day, and claims it taught her everything she needed to know to become a good cook. For decades though, she steadfastly ignored the Southern recipes. Unlike most of Australia's Italian migrants who had come from the rural agricultural South, she and her husband came from the industrialised North (albeit from the then-poorest pocket of the North, well outside the industrial golden triangle of Milan-Turin-Genoa). Their staples had been polenta and risotto. To my grandparents, who'd left Italy just before the advent of television sped up linguistic homogenisation, most of the Lygon Street Italians with their incomprehensible dialects and love of pizza were completely foreign. My grandparents' social circle was mostly limited to other Northern Italian migrants, and Anglos who'd good naturedly tease them for drinking 'plonk' rather than beer. For forty years Livia's sourced-from-Italy, learned-in-Australia recipes stayed true to her Northern roots, and avoided peperoncino at all costs ('Che schifo! ', my nonno would grimace, at the mere mention of chilli). Then a curious thing happened. In the late 1980s, they were persuaded by friends to join an Italian social club, the kind where the pipe-smoking men would play card games like briscola or scopa for hours while the women worked together to prepare a hearty communal dinner. For the first time, they were socialising regularly with a large group of Southerners and sharing meals with them. Frequent exposure to Southern Italian cuisine at the club transformed their tastebuds, making them more adventurous diners generally – but above all developing their love of chilli, to the point where nonno would clamour for more and more peperoncino in his sugo. And so nonna's sugo, which had been evolving since 1952, underwent its most dramatic change, receiving a turbo boost of chilli. The recipe continues to evolve to this day, though as a widow living alone with declining health she makes it less frequently now. I remain touched that my grandparents were able to adapt and appreciate good Southern Italian food, even at a late stage in their lives. Now let me just nail this damn recipe. Wow what an awesome story. So well written too. Its magic how far back some recipes can go. I love the story of their migration too - and empathise about being isolated from other migrants in this new country. I wonder what it is that makes her dish so much different to yours? Could it even be the stove its cooked on or the pots she's used? I can't think of many other variables that would be different - provided you are sourcing your ingredients from the same places she is. Oh! I also share sentiments about the food being terrible in Australia on arrival! My family arrived in '87 and '89 and moved to rural WA. I grew up with mums complaints about how terrible the coffee was and how outrageous it was that you could only get one type of capsicum in the shops. I haven't been game to try it for many years as we used to be grateful recipients of her sugo largesse weekly when you were all growing up. Now I'm counting on you to be the the one who nails the recipe for future generations of the family! Nice story. I've tried many times, with little success, to replicate some of my grandmother's traditional recipes. Why is it so hard?! A beautiful post and one that is dear to my heart. I have never quite managed to get the same flavour into my meals as those my dear friend Olga Giuliani made. I spent four years translating her memoirs. She also spent months at Bonegiila. What a beautiful story. I really enjoyed reading it and am heading to your tia's blog to read more. Could you please post the sugo recipe for those of us who don't have a nonna to hand one down to us?